James "Jim" Rancourt is a Massachusetts native who received his B.S. in Chemistry from the University of Lowell. After gaining industry experience he relocated to Blacksburg, Virginia where he earned his Ph.D. in Polymer Chemistry from Virginia Tech. He finished his Ph.D. while simultaneously starting Polymer Solutions Incorporated (PSI) in 1987. Jim has grown PSI through complimenting his passion for helping others with his love of analytical chemistry. 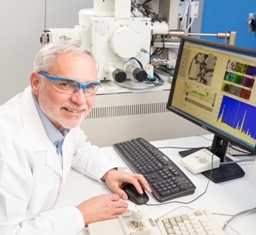 He has built a team of brilliant scientists and support staff which, coupled with the practice of great science, has resulted in PSI becoming the premier independent testing lab for plastics, polymers, rubbery, and metallic materials. SGS PSI serves companies in a broad range of market segments including the Medical, Pharmaceutical, Packaging, and Consumer Product industries. SGS PSI's clients range from the largest companies to small and promising innovative startups. Jim is recognized as an authority in his field and is frequently called on to provide expert testimony for a myriad of litigated matters involving manufacturing defects, design defects, misappropriation of trade secrets, failure analysis investigations, and patent infringement. He has given over 55 presentations, holds 7 United States patents, and has been published over 60 times. Jim was also recently inducted into the Virginia Tech Entrepreneurial Hall of Fame. You can read an in-depth article about Jim's background, recent award, and SGS Polymer Solutions here. When Jim isn't busy at SGS Polymer Solutions he enjoys running, biking, and spending time with his family--especially his grandchildren!